Venezuelan President Nicolas Maduro returned to Caracas Monday upon concluding a four-day visit to the People’s Republic of China, which saw the two countries sign twenty-eight bilateral agreements, including a new U.S. $5 billion Chinese loan and joint plans for a fourth satellite, in addition to strengthening political ties. The visit to China was the fourth by Maduro since taking office in 2013, and included top-level meetings with Chinese President Xi Jinping, the State Council’s Investigations Centre, the National Assembly, as well as a tour of late PRC founder Mao Zedong’s mausoleum. The trip comes as Caracas faces a hostile international environment with mounting pressure from neighboring right-wing governments, talk of a U.S. “military intervention,” as well as the continuing economic impact from U.S.-led financial sanctions against the country. Speaking from Beijing, Maduro qualified the visit as “a great success” and expressed that he was “very optimistic” about its results. For his part, the Chinese Foreign Ministry spokesperson Geng Shuang explained that his nation is looking to help Venezuela achieve economic stability. “I think that a Venezuela in constant growth is in the interests of everyone (…) This visit by President Maduro helps form mutual trust between both parties,” he stated. The internal situation is improving and the government of Venezuela is actively promoting economic and financial reforms. Maduro has recently looked to strengthen relations with Asian, European, and Middle Eastern partners to secure fresh credit lines for Venezuela’s beleaguered economy amid a U.S.-sponsored financial embargo that prohibits U.S. firms from lending. “I have had to overcome economic sanction measures by the U.S. and Europe, who persecute Venezuelan bank accounts, kidnap billions of dollars in international accounts and block commerce,” Maduro told Chinese state TV. Amongst the announcements was a new U.S. $5 billion loan to boost Venezuela’s oil industry, which has suffered from falling production, international court action, and a wide reaching anti-corruption probe. The new loan reaffirms China as Venezuela’s main creditor and follows on the heels of a previous pledge of financial assistance by the Chinese Development Bank in July. Despite rumours of a possible renegotiation of the terms of previous loans–which amount to an outstanding U.S. $20bn of around $60bn received since 2008–no official announcements have been made as of yet. The new funding will provide some much-needed breathing room for the Maduro government and is due to be channelled into numerous mixed firms in the Orinoco Belt with the aim of opening or upgrading 300 oil wells specifically in the 500 sq km Ayacucho Block 6 section of the Belt containing 31.2 billion barrels of heavy crude. As part of the agreements, Venezuela’s state-run oil firm PDVSA will cede 9.9 percent of its shares in the mixed Venezuelan-Chinese oil firm SINOVENSA to the Chinese state-owned National Petroleum Consortium (CNPC), which previously owned 40 percent of the company. SINOVENSA produces 130,000 barrels of oil a day in the Orinoco Oil Belt. Despite being signed between two state-owned oil giants, the agreement has once again provoked concerns from some analysts that Caracas is undertaking a “privatisation” of the country’s petroleum industry. In other announcements, Venezuela will now join China’s ambitious New Silk Road commercial plan which is allegedly worth U.S. $900 billion. The project looks to connect Europe, Asia, and the Middle East in a monumental economic road and maritime chain that will include 60 countries, 75 percent of the world’s energy reserves, and 70 percent of its population. Venezuela is the second Latin American country to sign up for the project, following Uruguay earlier this year. Maduro also announced 28 new agreements between China and Venezuela in energy, mining, gold, iron, technology, education, health, and culture. Amongst the accords was the unveiling of the route for Venezuela’s newest satellite, which will be named “Guaicaipuro” after the Venezuelan indigenous leader who led several anti-colonial armies to victory in the 16th Century. The satellite will be Venezuela’s fourth, following “Bolivar,” “Miranda,” and “Sucre,” and was developed with joint Venezuelan-Chinese technology. No launch date was announced. 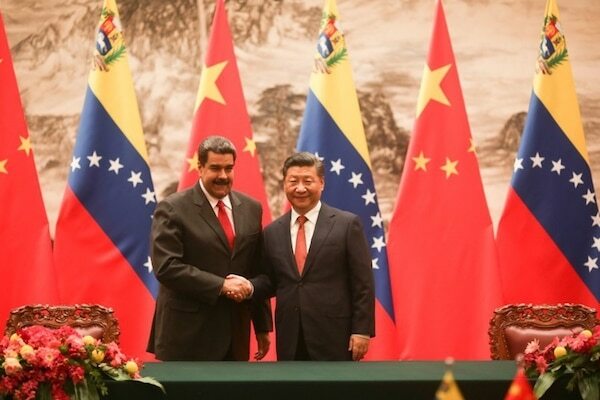 Other agreements looked to promote greater cooperation and financing between Venezuelan and Chinese gas firms and between the Yankuang Group multinational and the Venezuelan government in gold mining. Equally, the Chinese medical firm Meheco signed an agreement with Maduro’s government to sell vital medical supplies to the Latin American country, which has struggled to access crucial drugs such as insulin and anti-retroviral medication in part due to U.S. financial sanctions which Caracas recently denounced at the UN. Additionally, the Venezuelan state signed agreements with the Chinese iron firm CREC as well as with Chinese telecommunications multinational ZTE. The company, which already holds a significant market share in Latin America, is looking to expand cooperation in health, telephone technology, and electronic payment systems. Further agreements with application in crime fighting, such as CCTV networks, were also signed. Be the rector and facilitator of relations of economic prosperity, of the expansion of investments and the flow of commerce between China and Venezuela.